Although Chicago enjoys a global reputation as a foodie destination, fried chicken isn’t typically the dish that visitors rave about. Chi-town has always hosted a wide array of chicken shacks, but they fly under the radar of most “Best Of” restaurant lists. Well, thanks to an influx of fried chicken spots from the Carolinas, Memphis and Nashville, the city has developed a whole new appreciation for perfectly fried chicken. There’s never been so much crispy good stuff to choose from so it can sometimes be a dizzying situation to decide where to go. Help is here; consider this list of the best fried chicken in Chicago. Bring extra napkins. 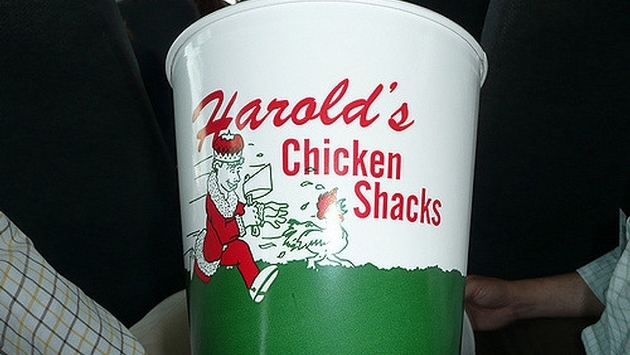 The ultimate, legendary chicken emporium in Chicago, Harold’s Chicken Shacks have been an essential Southside destination since 1950. Going to “Harold’s” is as much a Chi-town experience as deep-dish pizza and Italian beef —and for good reason. Serving up crackley, crisply fried chicken in portions of dark or light meat or even gizzards and giblets, Harold’s does one thing and it does it well. Harold’s shacks are now located all over the city and there are even food trucks, so there’s no reason to miss this fried chicken experience. Don’t let the white tablecloths fool you. Pearl’s Place delivers some of the best fried chicken in the city. This pleasant Bronzeville restaurant supplies an array of soul food classics from ham hocks to shrimp & grits, but you could easily just pile your plate full of fried chicken at the buffet and be very satisfied. The chicken is gently fried so that the pieces are juicy and never dried out. You can also choose from an a la carte menu if you want your chicken fried a particular way. This simple Lincoln Square storefront packs a lot of flavor in every plate, but all you need to order is the fried chicken and collard greens to find true fried chicken love. Luella’s chef follows recipes from his Mississippi grandmother, who likely knows a tad more about fried chicken than the trendsetters just jumping on the bandwagon. One bite and prepare to be lured back for a daily taste; it’s that addictive. A new entry to the scene provides surprisingly excellent fried chicken in the shadow of the Centennial Wheel. Yep, Big City chicken is located in the tourist mecca of Navy Pier but don’t let that stop you. Braving the crowds is worth a nibble of this pricey, brined and greaseless chicken. Moist and flavorful is the taste you’ll get with every bite although the spicy version gives an extra kick.